I am SO lucky to have a friend who continually buys coupon deals for great restaurants and then realizes that they are about to expire. Being the friend of hers who works at night and is usually free for lunch, I seem to keep benefiting from these purchases with lovely lunches and great company. Today we went to Gustorganics near Union Square. I looked up the reviews online to find a very mixed bag- some great and some horrible. Lucky for us, we had a great experience. The atmosphere is bright, sunny, clean, modern and springy. We loved the ‘living wall’ behind the bar filled with beautiful growing plants. The tables and menus were woody/grainy organic-ness that coordinated so nicely with the whole feel. Grass green cushions on the benches and chairs felt earthy too, and were surprisingly comfortable. Displays of stones and moss were tasteful and carefully placed in thoughtful stacks. Even the bathroom was cool- with a long wooden sink and open feel. The menu was very reasonably priced for organic food- and really for NY food in general. Plenty of sandwiches, salads, pizzas and more to choose from for under $10. I sipped my tasty 1/2 iced tea,1/2 lemonade while we figured out what we wanted to order. We decided to share two entrees and a dessert. 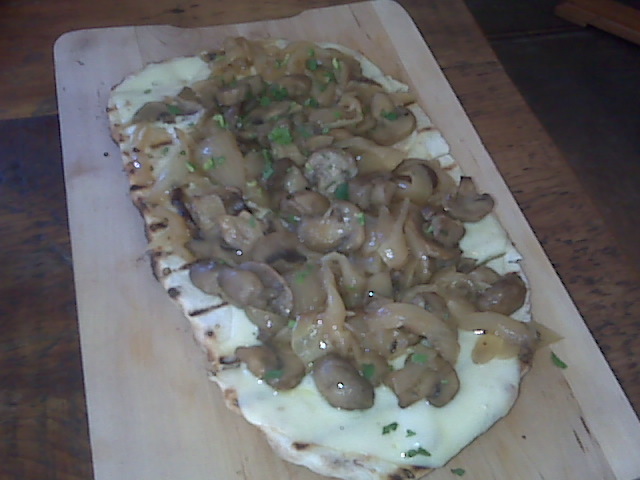 The flatbread pizza was delicious, covered in caramelized onions and fat, juicy mushrooms. The thin crust made it perfectly chewy without being too filling. 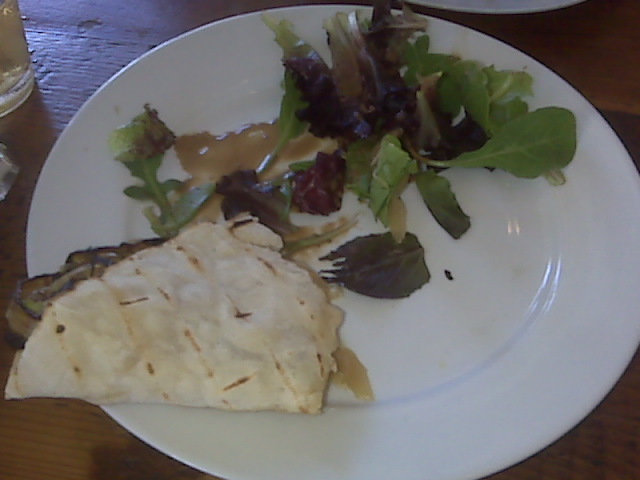 The sandwich was grilled veggies and cheese on a folded tortilla with a small side mesclun salad. Again, it was all very tasty and fresh. Healthy, but satisfying. At the suggestion of our waitress, we shared 2 cookies for dessert. Shortbread filled with dulche de leche cream. 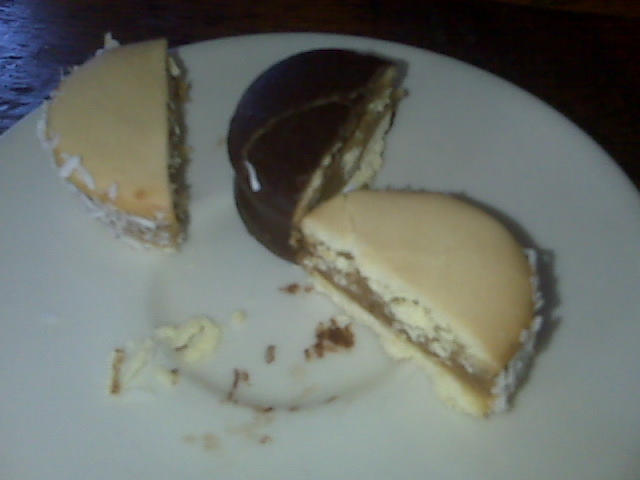 One was dipped in dark chocolate and the other was rolled in coconut. Both were rather enjoyable and different from any cookies I’ve had before. I would definitely recommend Gustorganics if you’re nearby and like clean, healthy, organic food. Though I’m not a big drinker, I plan to go back for cocktails someday because the drink menu was extremely appealing with only organic wines and liquors. Great find! >that looks so yummy! I love organic finds in the city!